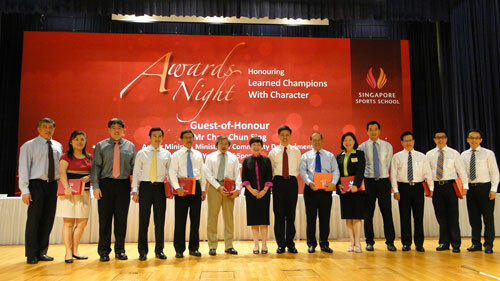 SAA President Mr. Tang Weng Fei (fourth from the left) with other NSAs President, and guest VIP. Singapore Athletic Association has signed a new partnership agreement with Singapore Sports School yesterday, which was held in conjunction with Singapore Sports School Awards Night. The deal which was initially drawn up four years ago in 2007 reaffirms the successful partnership between the two which had churned out National representatives at every sporting level in athletics. The renewed partnership will in turn continue to unearth and develop our young talent into world class athletes. Singapore Athletic Association was represented by SAA President Mr. Tang Weng Fei who with nine other National Sports Associations was present for the signing ceremony. In attendance was guest-of-honour Mr. Chan Chun Sing, Acting Minister of Community Development, Youth & Sports, dignitaries, VVIP, to the Board Members, parents, coaches and athletes.